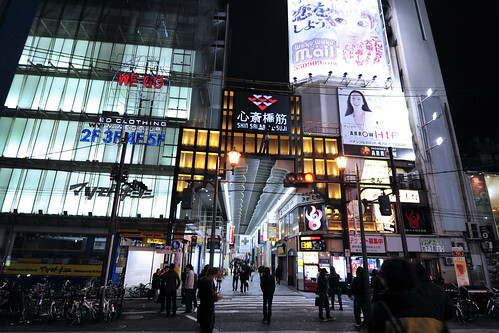 Venturing pass the main shopping corridor of Shinsaibashi, we’d reached Dotonborigawa 道頓堀川, whose banks are laden with restaurants and eateries of all sorts. 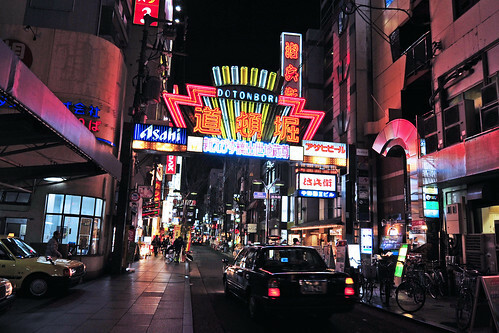 One photo caption I’d read over the net mentioned that “Dotonbori typifies the flamboyance of Osaka”, and I couldn’t agree more. 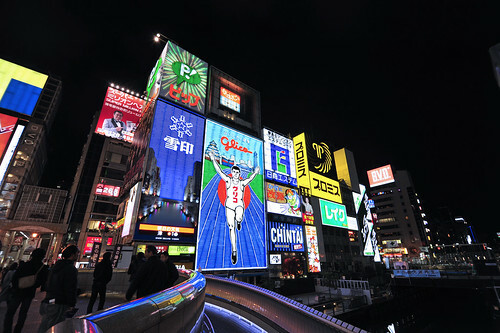 Colorful sights and sounds along the banks of dontonbori, made famous by a prominent Osakan trademark, the Glico “Running Man”. 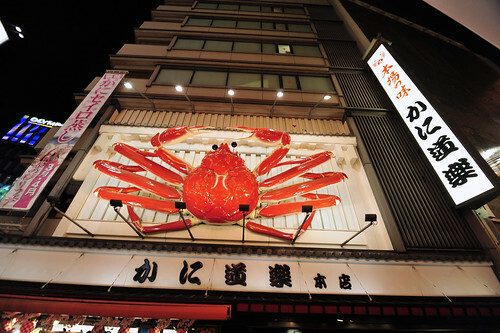 Yet another tourist “spot” along Dotonbori, a huge red crab spanning more than 6m straddling above the entrance of Kani Doraku restaurant which specialises in (you’d guessed it!) crab cuisine! 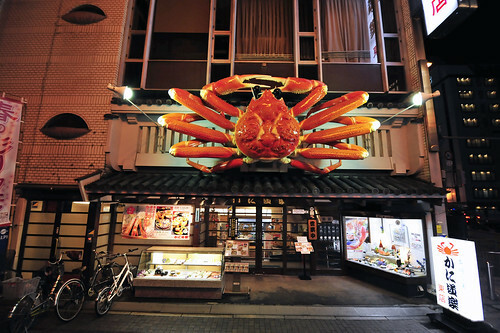 There are 3 joints along the whole eating street, making it a very prominent landmark. 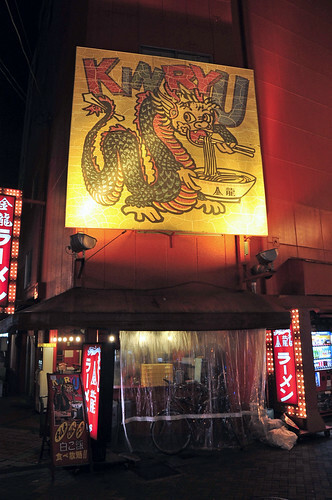 Our dinner pitstop for the day, Shi Ten Noh Ramen 四天王拉麵, a ramen joint along Dontonbori which is highly raved in the guidebooks we referred to. 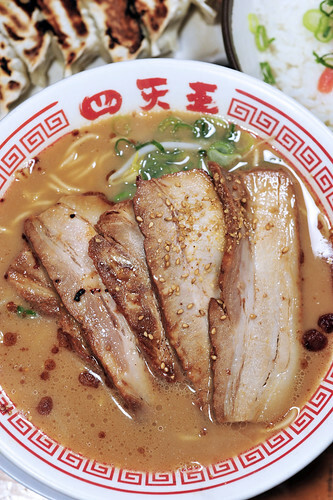 This is J’s shoyu char siu ramen 酱油叉烧拉麵. The broth is to thick, likening a tonkotsu soup base. 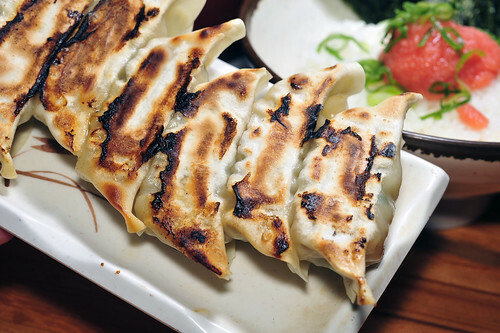 Our order of gyoza. 7 pieces for 300 Yen. 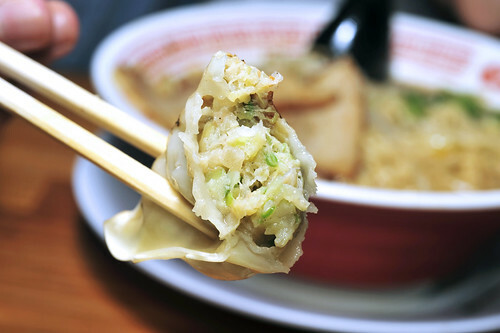 Biting through a gyoza, revealing a minced pork, cabbage and spring onion filling well-seasoned with ginger, garlic and salt. My order of Yasai Miso Ramen 野菜味曾拉麵. Very very delicious soup base. I dare say one of the best I’d had so far. 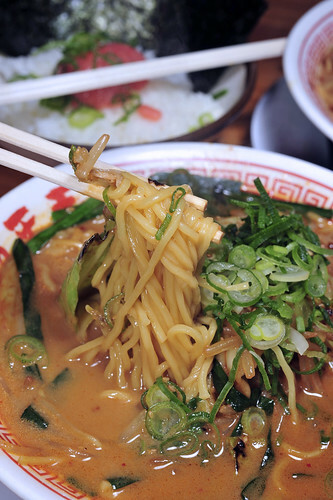 The miso has a hint of sweetness amidst the wonderful depth of savory. The sweetness and crunch of the cabbage was a pleasant surprise, only made possible because the miso base was just right and not overpowering. Slightly less and the soup would probably had tasted too bland, and a little more and it would had been very salty . Prima facie, I’d had thought something with meat would probably be more gratifying. 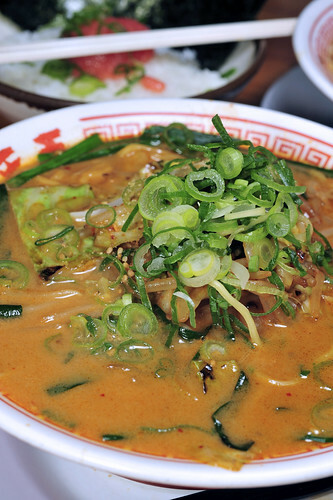 But this Yasai Miso Ramen is very good in its own right. The noodles very springy and just undercooked, giving rise to its ‘al dente’ 弹牙 textures. The shooting time allowed the noodles to soak up some of the soupy goodness which is much welcomed. 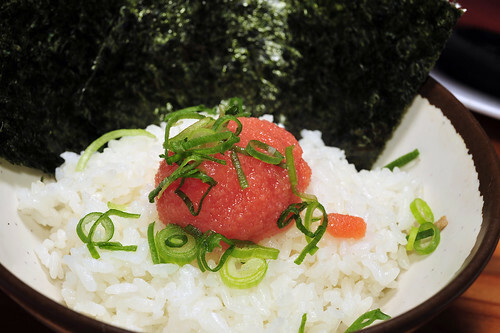 辛子明太子, karashi mentaiko, spicy cured pollock roe served with toasted seaweed (nori) and steamed Japanese rice. I first tried this at Ippudo in Singapore last year and had since been a fan for its robust flavours. The only nitpick is the dollop of mentaiko was too miserly to my liking. Then again, with good food, who could complain at being served a more substantial helping! Unlike the customary roulade we are used to seeing, 四天王 served their char siu as oblong slices with clearly defined grains. Fatty yes but so soft and absolutely melt-in-the-mouth!!! 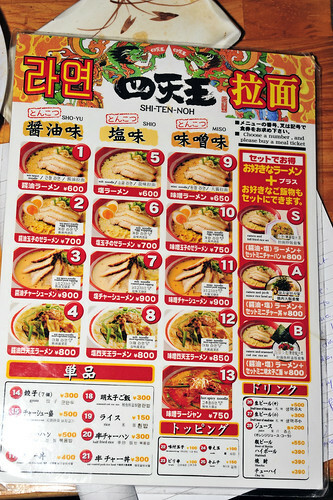 Shi Ten Noh’s menu comes in English, Korean and Chinese as well, from the influx of tourists from these places I’m sure. The waiting staff spoke a splattering of Mandarin and if I’m not wrong, one of the cooks there is a Taiwanese! 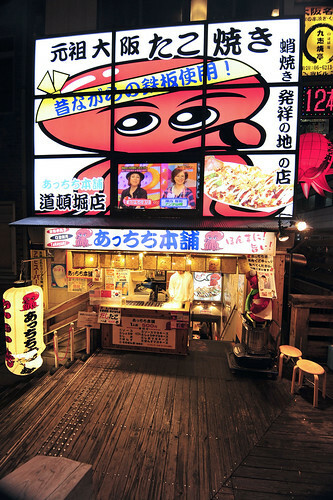 A shop that specialises in 串炸, basically an assortment of fried food in bamboo skewers. 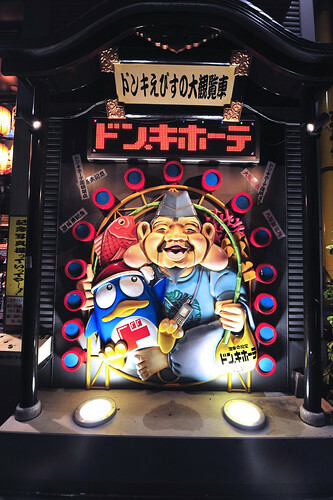 This is immensely popular in Osaka, especially around the Shinseikai 新世界 area. 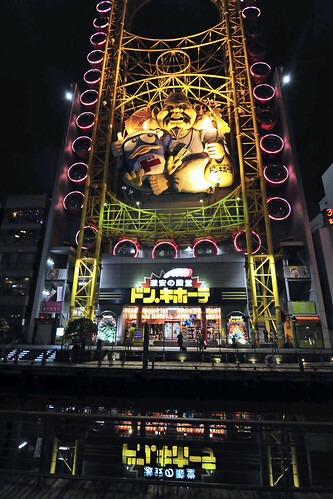 The latter is famous for its pachinko palours and shady activities. 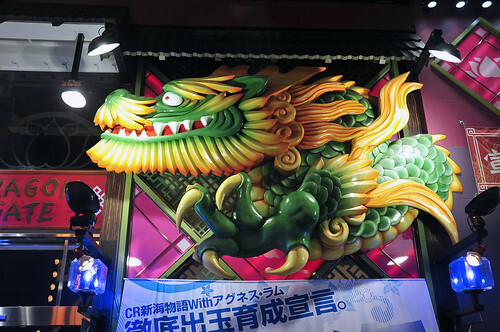 A building with a pair of dragons at the entrance. Somewhat cutesy don’t you think? 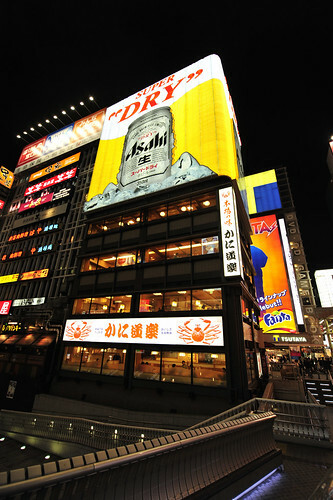 Kinryuu ramen 金龍拉麵, another favorite amongst tourists from Hong Kong, Taiwan and China. We’ll try this on another day. 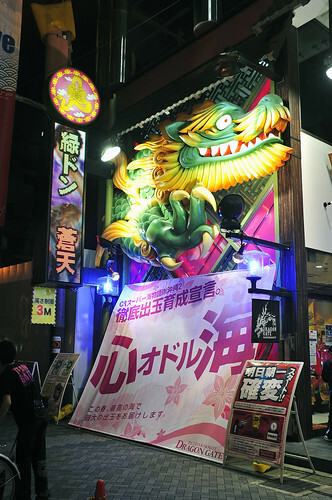 Yet another Kani Doraku joint, located at the eastern end of Dotonbori. 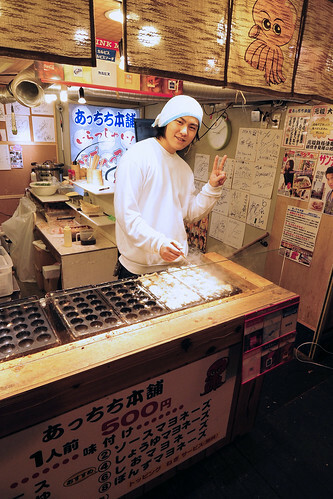 Takoyaki joint helper striking a pose! 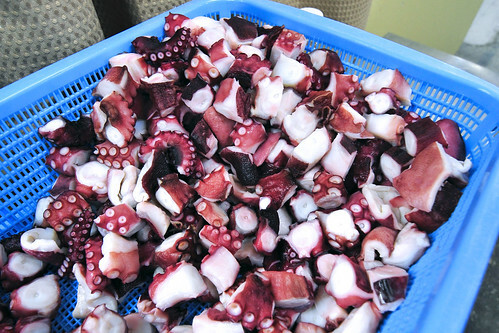 Huge chunks of octopus made visible to all incoming customers to show what goes into those takoyaki balls! 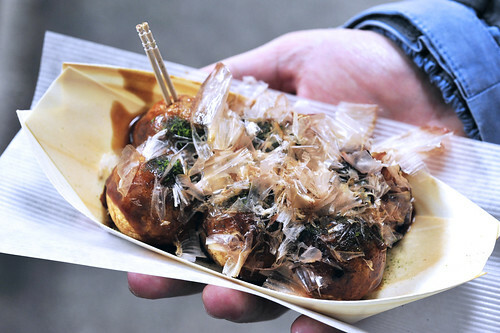 A “boat” of six laced generously with takoyaki sauce, mayonnaise and benito shavings. 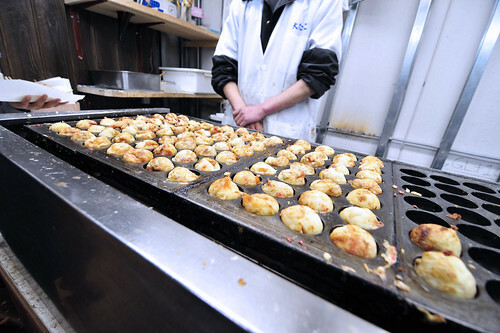 Another one of the very many takoyaki joints in osaka, a popular snack devised n the Kansai region. 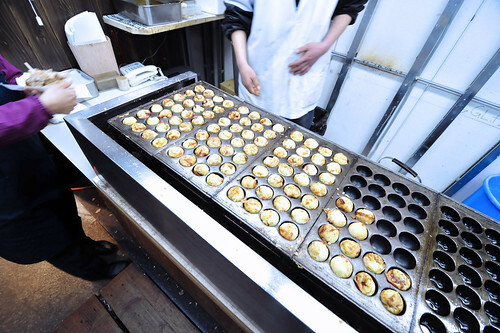 Interestingly, almost all of these takoyaki joints all claim to be the 元祖 “first” to have invented the dish. 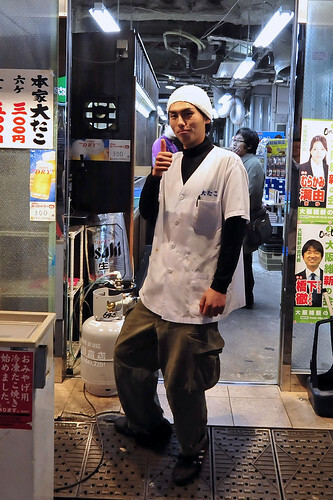 A sporting lad at the takoyaki store posing for the camera. 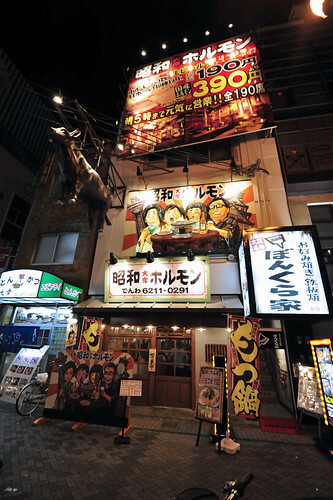 Don Quixote, or more commonly known as “donki” to the locals, is a 6-storey store located the northern banks of Dontonborigawa. It is very popular amongst the tourists as as well locals looking for a good bargain for anything from food to household electronic appliances. 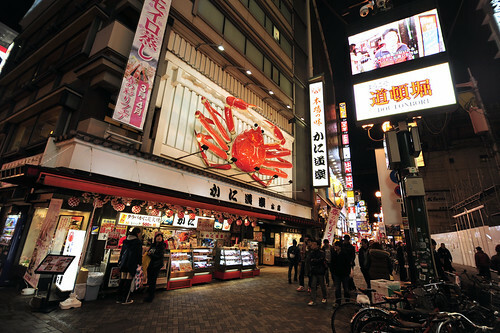 It promotes itself as a “duty-free” outlet where tourists are able to put forth tax claims. This is however, only applicable for the luxury items on the top floor, e.g branded watches and handbags. Otherwise its still a very good place to shop for local foodstuffs and knick-knacks. I got quite a lot of food and liqueur stuff from here. 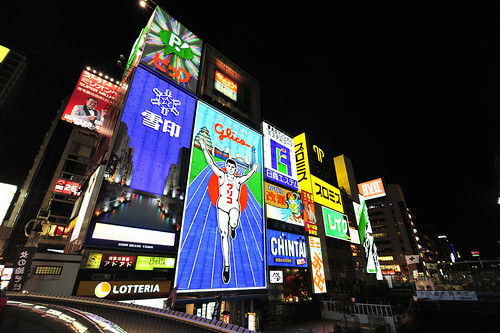 A definitely must-drop-by place if we are in Osaka. 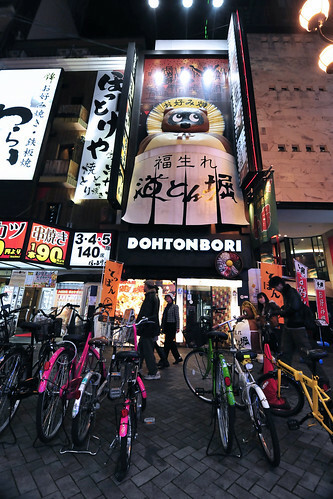 Donki’s “mascot”, Ebisu, one of the 7 fortune gods carrying a penguin! Slowly making our way back to the hotel, crossing Dotonboribashi again. 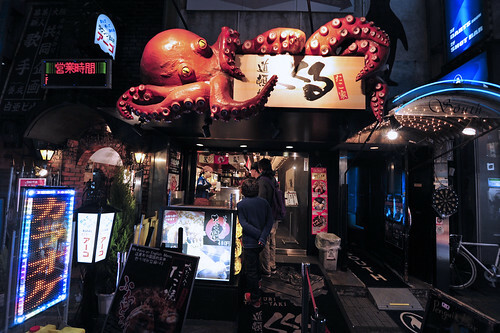 Yet another takoyaki joint, this time with a gigantic octopus that seemed to be engulfing the signboard! 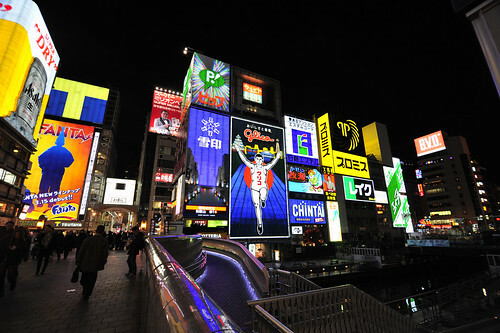 Back to Shinsaibashi suji, from dontonbori bashi. And one last glance before we make our way back to the hotel for a good night’s rest. This entry was posted on April 7, 2011 by Alan (travellingfoodies). 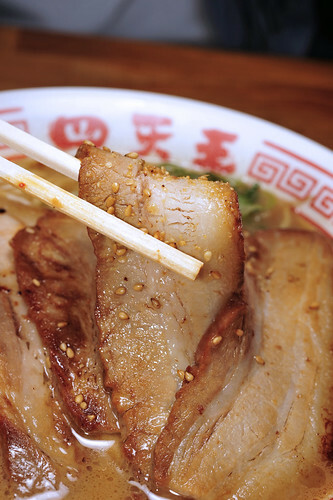 It was filed under Food, Travel and was tagged with たこ焼き, cha siu ramen, 章鱼烧, donki, dotombori, 道頓堀, 锅贴, 関西, 難波, gyoza, Japan, kansai, kix, mentaiko, miso, namba, osaka, shi ten noh ramen, takoyaki, yasai, 叉烧拉面, 味曾拉面, 四天王拉面, 大阪, 心斋橋筋, 日本, 明太子. 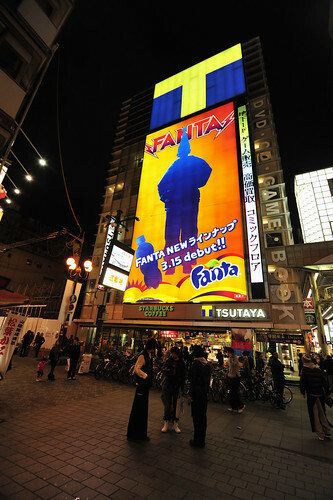 hi alan, yes, must be the same fanta that we used to drink when we were small, it carries the same logo. almost forgotten abt this drink cos i hardly see them nowadays. 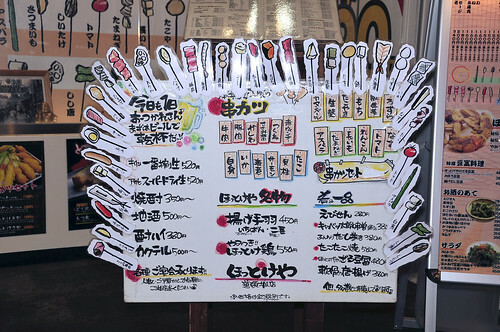 Ooo, i’m just hungry looking at those ramen but i wld prefer the cha siew be in smaller pieces. So not only you carry one big bag home , you also carry one big tummy back!! Hi lena! I thought so too! It certainly brings back memories of drinking fanta orange by the glass bottle at a neighbourhood provision shop, locally called “keg ai”. The ramen is fantastic. how did you get such nice images, all at night too? Did you use a tripod? hi janine, the street photos are taken without tripod. I used a slightly higher ISO and tried to rest my hands on something to stabilise them. My “personal limit” for lowest shutter speed still capable of producing decent photos is around 1/60s. Anything slower than that and the photos would turn out kaput! Ramen photos were taken with a flash system.